The VirtualToxLab is an in silico tool for predicting the toxic potential (endocrine and metabolic disruption, some aspects of carcinogenicity and cardiotoxicity) of drugs, chemicals and natural products. 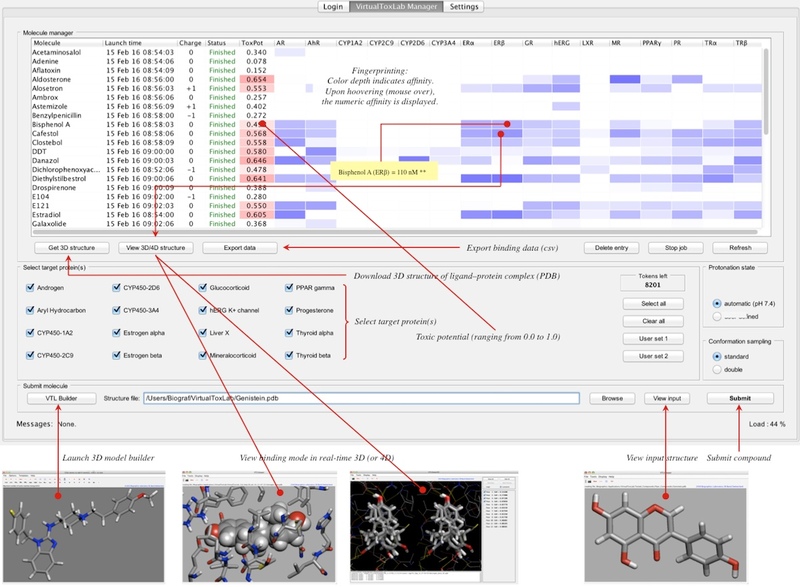 The toxic potential (ranging from 0.0 to 1.0) is computed by simulation and quantification of the binding of a small molecule toward a series of 16 proteins known to trigger adverse effects. The OpenVirtualToxLab is a forum for the calculation and exchange of in silico toxicity data. It has been launched for institutional users with occasional need of the technology and is freely available to non-profit organizations. The documentation to the VirtualToxLab (20.3 MB, pdf) can be downloaded here. An overview of all available VirtualToxLab licenses is given here, the VirtualToxLab services are listed here. Please note that the VirtualToxLab interface requires Java Version 8 for a proper function of the embedded 3D/4D viewers and the 3D model builder. If necessary, you can download/install the JRE (Java Runtime Environment) from → here. This may not work out for all operating systems. In that case, download/install the JDK (Java Development Kit) from → here. 2. If you agree with its content, download the application form → here, complete it and have it signed by a faculty member or an authorized officer. 3. Return both documents (license and completed application form: doc or pdf formatted) as attachments to a single E-Mail to molecularmodeling@unibas.ch. Please understand that we cannot accept applications originating from anonymous E-Mail addresses (such as hotmail, yahoo or gmail). If your application is complete and correct, you will be provided with the OpenVirtualToxLab interface and a personal password to access the technology. The Java-based interface includes a 3D model builder and a 3D/4D viewer. With those pieces of software you can readily generate the 3D structure of any compound of interest and submit it to the OpenVirtualToxLab. After due time (depending on size and flexibility of your compound as well as on the number of selected target proteins), the OpenVirtualToxLab returns the computed toxic potential (a toxicity alert) and the affinity profile towards up to 16 target proteins (cf. example below). The built-in 3D/4D viewer allows you to analyze the binding mode(s) in real-time 3D and atomic resolution. With the VirtualToxLab interface you can analyze individual results as they emerge.